Training and onboarding set the foundation of a good employee, but without a solid personality and positive attitude, molding a successful loan originator can be a challenge. Reverse mortgage professionals can be unveiled in many types of individuals with the proper training combined with solid core values, says Mike Crossett, executive vice president at The Federal Savings Bank, which is currently in the process of launching a new training program for industry loan officers. The Federal Savings Bank launched Mortgage Banker University a few years ago and are soon rolling out the same program specifically for Home Equity Conversion Mortgage training. The program will be mainly for fresh new talent. Mortgage Banker University will be held at The Federal Savings Bank’s headquarters in downtown Chicago and is a comprehensive, fast-paced program, explains Crossett. “The program will teach all of the technical aspects of mortgage lending for the first 30 days,” he says. Then the next 90 days are set aside for a formalized mentor program. This is when students will attend classes 2-4 days a week for two hours per session. In these classes students will receive additional tactical information that can help grow a reverse mortgage loan origination business. The classes will focus a lot on how to become a referral powerhouse. 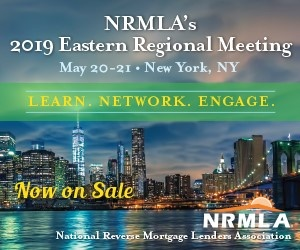 “I believe the larger growth for the reverse mortgage industry is in working together with a senior’s existing group of advisors that they already have trust in, like CPAs and attorneys,” Crossett says. Since the Department of Housing and Urban Development has changed the reverse mortgage product for the long term, there was no better time to roll out this program, Crossett explains. To even be accepted into the program, there is a 30-90 day interviewing process and each cohort will have 10-20 students. Everyone who is selected for training will automatically be an employee of The Federal Savings Bank. The program mainly targets people who are new to the the industry, but The Federal Savings Bank is interested in people who also may have experience in financial services or investment fields, but it’s not a requirement. The Federal Savings Bank is veteran-owned and operated and focuses on VA loans and FHA loans for military and first time home buyers, so recruiting individuals from the military for the program is also a large focus. Character is at the core of being successful in the reverse mortgage industry, Crossett points out. Once training is complete, all of the students will then transition into facilitating reverse mortgage transactions specifically for The Federal Savings Bank’s reverse product, LifeWise. The Federal Savings Bank anticipates to roll out the HECM sector of Mortgage Banker University in the fourth quarter of this year, or in early 2017.